DVD+R DL or Digital Versatile Disc, Recordable Dual Layer plus format is an optical storage format that’s an extension of the DVD+R and engineered by the DVD+RW Alliance to rival market dominance of the DVD-R DL. The recordable dual layer disc, also known as the DVD+R9, was first introduced in 2003 by Phillips and MKM. DVD+R DL can hold approximately 8.5GB of data, which equates close to 240 minutes of audio and video storage. It’s suited for write-once storage at almost double the capacity of a single layered disc. The disc’s characteristics make it versatile for professional and consumer uses, especially for archival purposes. 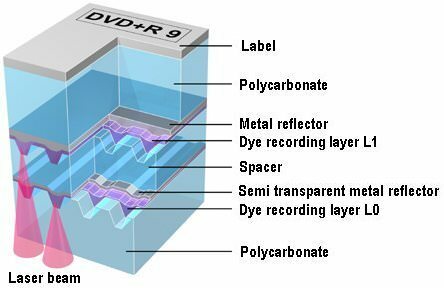 Like its competitor, the DVD+R DL has two recordable dye layers. The disc’s reflective layer launches the laser’s light to the lens to comprehend the signal. The DVD drive records on the first recordable player by starting in the center and spiraling outward. When the first layer is filled with data, the laser shifts to the second recordable layer and writes starting at the rim and spiraling inward to the disc’s hub. This orientation path is known as the Opposite Track Path (OTP). Consequently, the layers share both a lead-in (boundary at which recording is available to start) and a lead-out (boundary at which recorded data ends). The driver’s laser shift between the layers can be distinguished by the technology’s user by the pause. This is not a defect but rather the nature of the recordable dual layer disc. DVD+R DL differentiates from DVD-R DL in its efficient built-in system of lossless linking. This feature will optimize a user’s storage space and random access to tracks through its recording at variable bit rate. The recordable plus disc format is backward compatible with various DVD-ROM drives, DVD players, and consumer DVD electronics if they support dual layer technology. The price of dual layer drives is now comparable to single layer drives in today’s market.